These two DIY stamp projects look like fun. Left: Cathe Holden's pennant rubber stamp roller. Right: button stamps made from spools by Maximum Rabbit Designs, via Craft. Very cute - I'm going to customize my mail from now on! oh! those are adorable. thank you so much for sharing. That is so neat! Thanks for sharing. Yes! I love the button stamp. Thanks! 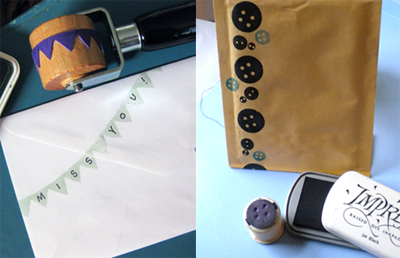 ooh thanks for sharing my button stamp - love the bunting roller too! omg. too freakin' cute! love it. doing it. I love these ideas! What cute ways to dress up packages! And here I was using potatoes all this time. HEY! I have buttons, ink, and should have an emprty spool soon! I see some button stamping in my future! So cool! I may have to borrow this idea for a craft project with 1st graders...thank you! You have a great eye for clever projects! Thanks for these links. That is so cool! Thanks for sharing it. Thanks so much for sharing my pennant rubber stamp roller project! I'm in such fantastic company with that darling button stamp! Too cute. Have you seen this program: http://iographica.com/ ? It's a cool thing! I love it. I will continue visit your site. I've done some bookplate stamps. I've found that adults love them as much as kids. So cool... I love the buttons!! ;)You are clever... I like clever! !